Meteorologist Rick Smith responds to messages on the National Weather Service Facebook account. On stormy days, the forecast office in Norman often receives messages every few minutes from people worried about tornadoes. The National Weather Service is working with mental health providers to address storm anxiety in Oklahoma. Rick Smith’s fear eventually turned into a fascination. By day, Smith watched storms from his window and pored over pictures of tornadoes in the library. 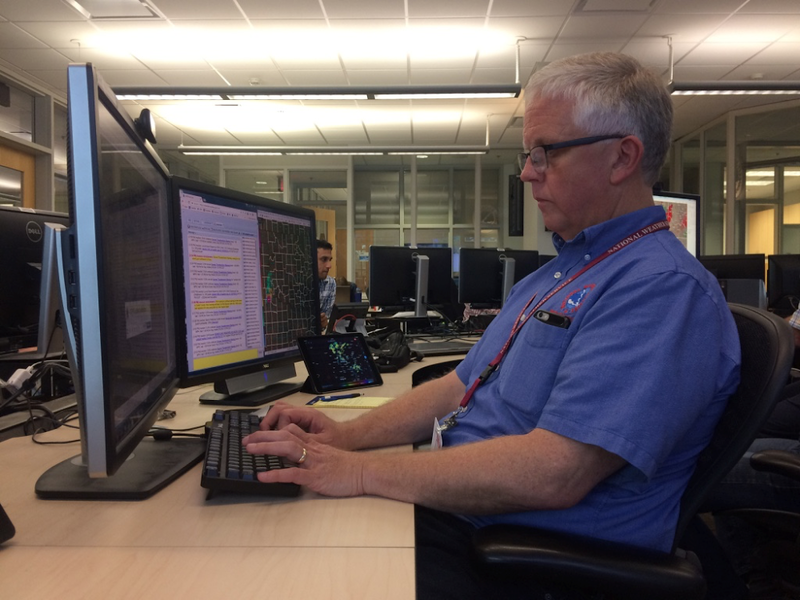 Now, decades later, he works as a warning coordination meteorologist at the National Weather Service forecast office in Norman, where he relays weather information to the public on a daily basis. And he sees firsthand how a fear of severe weather can affect people’s everyday lives. On stormy days during tornado season, Smith and other meteorologists in the Norman office often answer dozens of calls from panicked local residents, wondering if, when and how tornadoes might affect them. Some people call several times a day, asking the same questions over and over. Others message the National Weather Service on Twitter and Facebook every few minutes for hours at a time. “People are very clearly disturbed and bothered and upset by just the forecast of a severe storm. It’s not that they’re scared of the storm, they’re scared seven days before the storm ever gets here, and that’s prevalent,” Smith said. These interactions happen so frequently that Smith and others in the Norman office decided they needed to address storm anxiety in the community. The Weather Service has begun posting mental health resources on its social media to a warm reception from followers. And the Norman office has reached out to specialists who see the effects of disasters on mental health, both immediately and over the long term. One of these experts is psychologist Dr. John Call. He runs the Stress Response Team of the Oklahoma Medical Reserve Corps, a group of licensed mental health professionals, healthcare workers and other volunteers that deploys in response to tornadoes and other disasters. Call has developed a training for the meteorologists who answer the phones at the National Weather Service. They’re planning to schedule the training this month. It focuses on teaching anxious callers to be self-reliant and find ways to solve their own problems. “The golden rule is to help the individual develop a plan that will enhance their self-efficacy. If you enhance their self-efficacy you’re going to enhance both emotional and physical resilience,” Call said. For example, if someone calls the forecast office in a panic, a meteorologist could calm the person down with deep breathing techniques. Then, she could give the person instructions on how to find shelter during a storm, or direct the person to the Stress Response Team website, which features many more resources for storm preparedness and disaster mental health. “If you have worked this through, then you have a sense of coping. You know what you need to do if something happens. And if you have a sense of coping, a plan of action, then you feel efficacious, you feel like you have a better handle on it. And therefore, your anxiety goes down because you have a sense of ability,” Call said. A preoccupation with the weather is just one of the symptoms of storm anxiety, said Angela Steinle, a disaster response community outreach coordinator at the nonprofit Mental Health Association of Oklahoma. Other symptoms include difficulty concentrating, or specific fears like being separated from one’s family or pets. Often, people who have survived severe weather events need to rebuild their homes or replace property and important documents, and they can develop a dread of reliving those experiences, Steinle said. Physical symptoms of anxiety can include dizziness, nausea, shortness of breath and shaking--all part of a primitive “fight or flight” response, according to John Call. “Basically it is the idea, the same kind of fear that you would have, both physiological and emotional if you were being attacked by a grizzly bear,” he said. Taking deliberate steps to calm one’s anxiety is the best way to cope. Call recommends having a clearly defined plan for evacuating in case of a storm, pre-packing bags with essentials like food and radios and talking to children so they’re prepared for severe weather. There are few disaster mental health specialists like Angela Steinle and John Call in Oklahoma. A lack of funding for mental health in general means few financial resources for nonprofits like the Stress Response Team and the Mental Health Association of Oklahoma. Call is retired from a long career, and works for the Stress Response Team on a volunteer basis. He says his group received a grant worth more than $32,000 in 2014, specifically to help victims of the May 2013 tornado in Moore. But funding has declined to nothing this year, and he doesn’t expect any money in 2018. Steinle said that funding for disaster mental health is especially inconsistent. It comes in waves, often in the aftermath of a large disaster, like the Moore tornado. “It tends to ramp up and ramp down, which doesn’t give programs time to fully develop,” Steinle said. Her position at the Mental Health Association of Oklahoma is funded by grant money from the United Way of Oklahoma, totaling more than $275,000. The grant was awarded in 2014 specifically to help victims of the Moore tornado. She says the funding will probably run out this July. When that happens, she plans to keep working in disaster mental health as a volunteer for the Stress Response Team. But her job at the Mental Health Association won’t exist anymore. “The specific education related to storms, it won’t exist,” she said. As a meteorologist, Smith still experiences storm anxiety, often checking his phone first thing in the morning for weather alerts. He wants people to remember that storm anxiety isn’t all bad. It makes sense for people to be afraid of storms, Smith said. The challenge for the National Weather Service is conveying the danger of tornadoes and storms without causing panic. “We want people to have a healthy respect and a healthy fear. You need to be afraid of tornadoes. They can hurt you, they can kill you and they can destroy property,” he said.